we got to do a few things as a family...and we worked pretty hard. first, we picked our apples from our trees in our back yard. and that picture doesn't show all of the apples we picked! yeah, i'll be up to my armpits canning apple pie filling this coming week. then we went on a scenic drive out to get some fire wood. 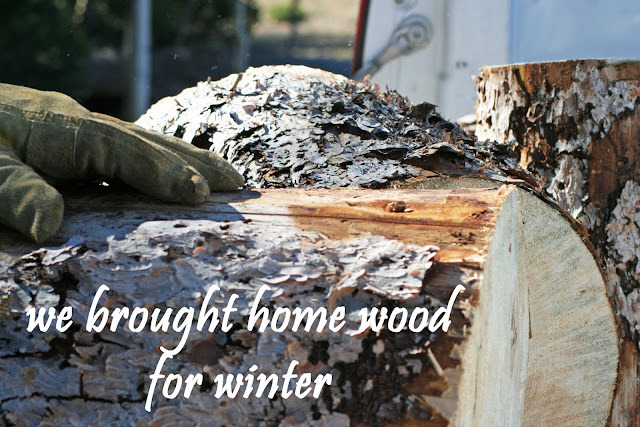 with fall here, and winter knocking (or is it mocking) on our door, mr. v and co. got his permit to get us some wood. 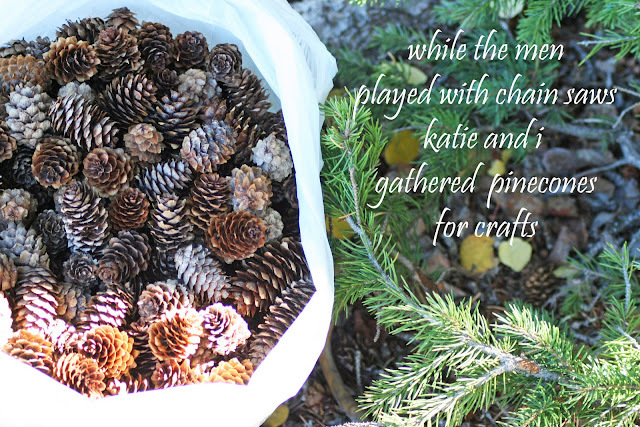 at one point i had all the kids gathering up pinecones...but mainly i kept katie occupied picking up one at a time. oh...you betcha there's a craft right around the corner with those babies. come back tomorrow and i'll show you. 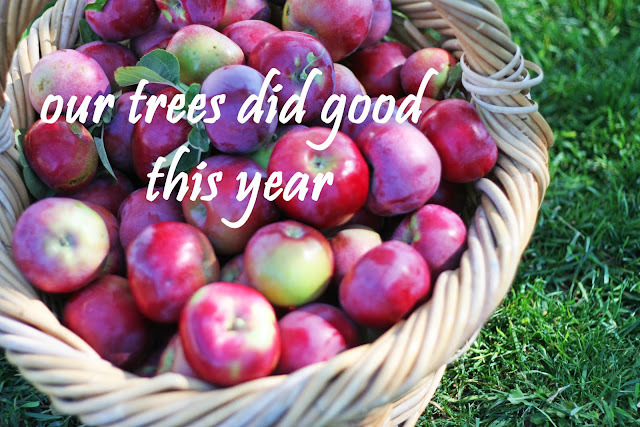 V, did you know those apples will keep "fresh" by themselves well into February? In WA, our neighbors picked a ton of Fuji and we kept them in burlap sacks in the cool basement (~55degrees) and they were still almost crisp all the way into February. It was awesome. Good job with those apples! Home grown apples are TOUGH to grow and still get any edible fruit! I love these photos! And wow, that's a lot of apples! I've canned applesauce the last few years and my kids love it. It's a lot easier if you use one of those apple peeler/corer/slicer thingies. A kitchen gadget that is really worth it! Applesauce is so easy, and if the apples are good, you only add just a tiny bit of sugar and a little cinnamon and maybe a little water and that's it. Then you just cook it for a really long time in a big pot and then can them. It's so yummy! It's awesome that you grow your own food- someday I'd like to do more of that. I'm excited to see your pinecone craft ideas! Boy, would I love to live on your property!! Lots of fun stuff! I agree with Jackie...when I grow up I wanna have a home and property like yours! So many fun things to do! Wow, looks like your family had fun this past weekend. Watchout, you might get lotsa recipes again. Apple pie filling sounds good. Sounds like you will be having more fun this weekend doing all the canning. Think of all the other things you can make with apples. Luckily you can make breakfast meals with them, have them at lunch and of course dessert. My fave thing to make with apples in the fall is apple fritters. Ahh! So beautiful! I'm jealous! oh, how I wish I had an apple tree. My mom had a small orchard. She used her slow cooker to make the BEST apple butter with the less good apples. I miss her and her apple butter. Store bought is not the same. 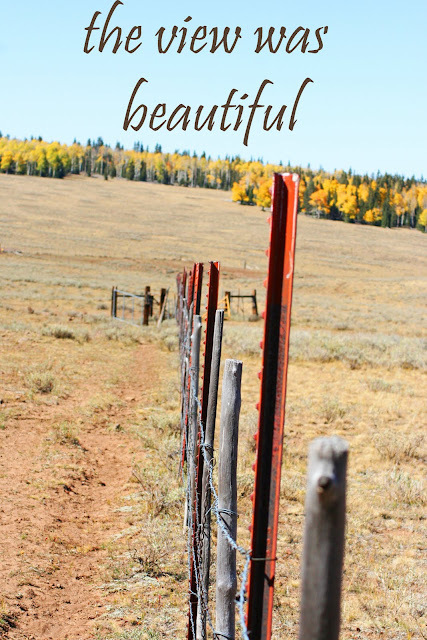 Your posts are always beautiful!! I want fruit trees in my yard! I think it would be lovely! But I don't know if they would do well here in southern Alabama. If the weather didn't hurt them all the bugs here would! If summer is my favorite season, why do I seem to miss all of the trappings of a tradtional fall season? Can't wait to see the pine-cone craft. love the pictures!! Just found your blog & it is lovely!! WOW! 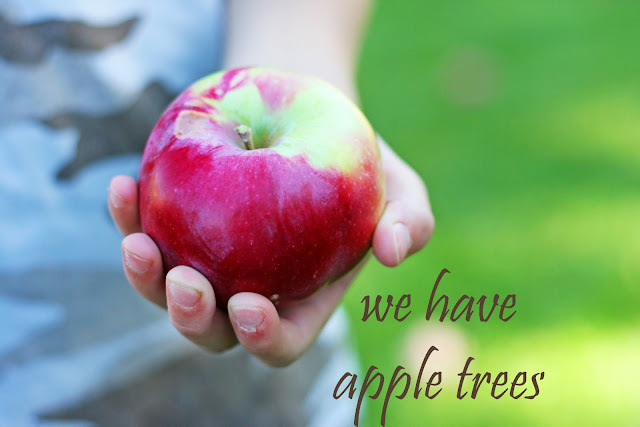 Your own apple tree???? I would love to have that in my back yard. By the way, are you going to share your recipe for apple pie filling? I think you have a gift for photos. They are beautiful and make me want to visit your blog daily. Thanks for sharing such lovely images. I love your pictures! Those are so good! The fence and the wood with the gloved hand! It was so good to see you for 2 seconds the other day. PLEASE let me know when you guys come up and we can go out to lunch! these are the things that make everyone jealous that you live where you live! How FUN! 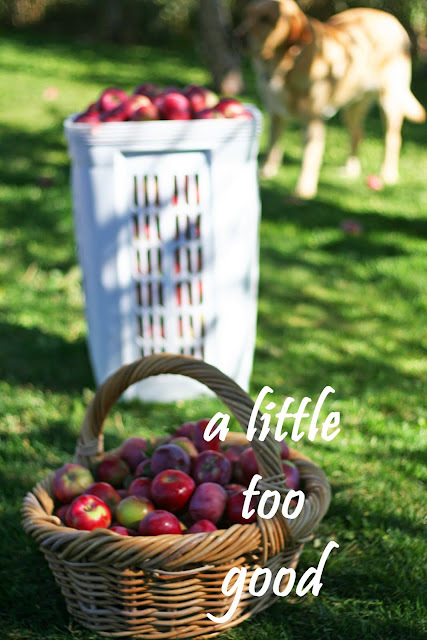 I just happened upon your post from another but I am in love!~ So many cute fun things, and your apples.....whew! best of luck! Wondering were you live in ? Love the view! I myself an in utah.